Saviour. 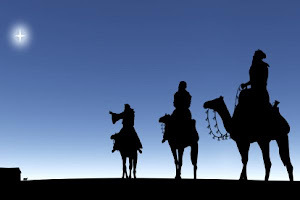 These three men were foreigners, or ‘outsiders’ from a far-away country who had trouble in coming to Bethlehem. They bring gifts of Gold, Frankincense and Myrrh. The star that led them to Bethlehem will be given pride of place. Lord, let the light of your love shine in every heart, starting with me. Amen. The opening days of January may be cold and nature bleak, but the church still glows warm with the peace and joy of Christmas. We dedicate the New Year to Mary on the January 1st Solemnity honoring her as Mother of God; and on January 6, the Solemnity of Epiphany, we rejoice with her, as her Son is adored by the three Wise Men. In this liturgical season the Church eagerly follows Our Lord as he gathers his apostles and announces his mission. At Cana’s wedding feast he performs his first public miracle at the request of his Mother, and his disciples saw his glory and believed in him. The month of January is dedicated to the Holy Name of Jesus. Jesus' name is chosen in heaven, and the Angel Gabriel announces it when he informs the Blessed Virgin of the incarnation: "Behold thou shalt conceive in thy womb and shalt bring forth a son, and thou shalt call his name Jesus". It is a name that has marvelous implications, for it means "saviour." The very name bespeaks the magnitude of His mission, His infinite love, a love that will cause Him to offer Himself up for us. The name of Jesus is the sweetest of all names, and He who bears it is most worthy of all love. He who calls Jesus his friend can be assured that this friend is the most devoted and unselfish of all friends. Jesus is our all. In His name we may pray to the Father with assurance of being heard. In His name the Church administers all her sacraments. In His name she offers all her prayers and blesses homes, the fields, and the sick. In the name of Jesus she casts out evil spirits, and at the hour of our death bids us, "Go forth, Christian soul." She assures us that whoever shall call upon this name will be saved. When our soul has departed this life to seek its eternal home, the Church asks in the name of Jesus, "Eternal rest give unto him/her, O Lord." The last months of Pope John Paul II’s life were in some way painful to watch. It was distressing to see someone who was once so strong and vigorous now struggle to utter even a single word. It was distressing to see him no longer able to walk or even stand unassisted or to control the terrible tremble in his hands. And yet John Paul II was not embarrassed to be seen in his frailty and his infirmity. He was determined to keep on exercising his ministry in public, even if his strength was ebbing away, even if it was obvious that he was a sick man. John Paul wanted to bring sickness and death into the middle of life again. He wanted to show people how to live with and accept the reality of suffering. He wanted people not to shy away from it or deny it. He wanted to rehabilitate it in the eyes of the world. It was a lesson our western world needed to learn because our society today is one that is uncomfortable with having to deal with pain. It is a society that celebrates youth and worships the body beautiful. It wants to hide away the reality of sickness, suffering, old age, mortality. It doesn’t want to have to accept them. Our Christian faith helps us to face pain and the reality of suffering. It is about trusting in Jesus and his healing presence on our lives. Body of Christ save me. Water from the side of Christ wash me.